Toast the dried ancho chilies by putting them in a preheated 200°F oven for 3 minutes, do not let them burn. Remove the toasted chilies from the oven and open them up. Remove and discard the seeds and stems. Place the chilies in a bowl and cover with very hot tap water. When chilies are soft (after about 15 minutes), remove them from the water and place them together with the chipotles in the work bowl of a food processor, along with the garlic, oil, cumin, cloves, salt, and pepper. Pulse to make a rough paste. Rub the paste all over the pork loin with your fingers. Cover the rubbed pork and refrigerate for 8 hours. Remove it from the refrigerator 1 hour before you want to start cooking. 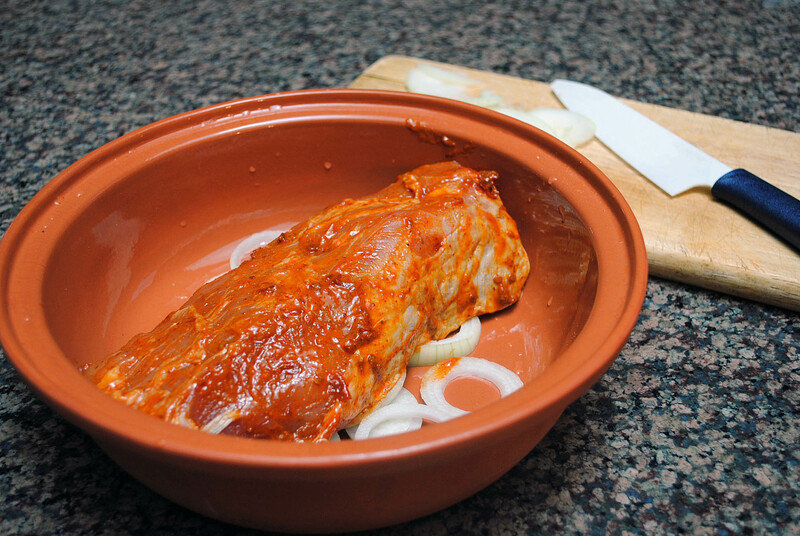 Make a bed of half the sliced onion in the clay pot. Lay the marinated pork loin over it. 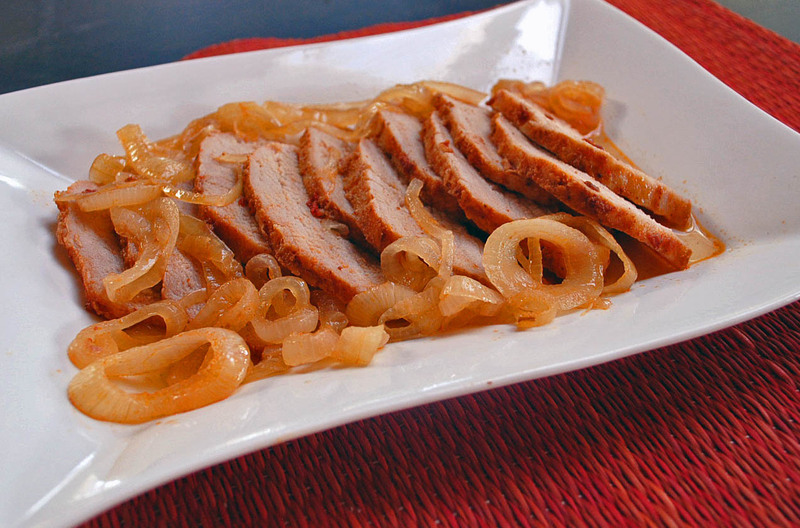 Cover the pork with the remaining onion. Do not add any liquid. If your clay pot is unglazed, you may have to soak it (or only its lid) in water before using. Follow the instructions for your clay pot, but almost any brand needs to go in a cold oven, so place it in the oven and turn it to 300F. Once it reaches the temperature, cook, covered for one hour. Do not open the pot. After one hour, remove the roast from the oven. Let it sit in its broth, still covered, for 10 minutes. Slice the roast thinly and serve. “Life is a matter of taste…” ENJOY! I cannot praise this recipe enough! The color in the photo was not enhanced by Photoshop or any other trick. The chilies give the onions an amazing red/orange tint, and the clay pot locks in moisture, so that the dish creates its own juices. I left the onions whole around the side of the serving dish, because Phil prefers to avoid them, but you could remove them together with some of the cooking juices and process, making a spicy sauce to spoon over the meat. Thickening it with some type of starch would be optional. I like this preparation on the lighter side. Whatever you choose to do, the key is to cut the pork in very thin slices. They will be tender and juicy, almost as if you brined the meat before cooking. Almost ready to go into the oven…. Sally one more reason to get the Romertoph down from the top shelf. Thanks. Roasting the chilies intensifies their flavor in general, but since I removed the seeds before using in the sauce, it wasn’t fiery hot – if you don’t have the chipotles in adobo, you can always get it dry and proceed the same way, roasting and softening in hot water. Any type of chilies you like could work well here, I suppose. I always serve it with rice, my Brazilian nature begs for it, but it would be great with mashed potatoes, or a other mashed root veggies, even a carrot puree would be delicious. Orzo… and, you know, leftovers turned into a simple sandwich – delicious, though! I love the flavors in the rub and will certainly try this! Phil is a lucky man… this looks delicious! I love how food connects us with our fondest memories. I’ve always wanted to get a clay pot and now I really have a reason to! So I wonder, was this the dinner that lead to marriage?? Well, well, well… tricky question… but, if I had to associate one dinner with our marriage, it would be Beef Wellington, particularly the first time we made it, everything from scratch, including the puff pastry. Memorable weekend that was! Pork loin is just wonderful and this does look full of flavor. We adore our Romertopfs, so thank you very much for this recipe, Sally! I like the glazed versions too – we put ours straight into the dishwasher (which is also why we’ve bought all the Emile Henry). The pork loin looks fantastic, and I’m sure the recipe would scale up for a larger pork cut to feed my tribe! I’m sure it scales up fine, Celia – for us that piece of roast was enough for a full dinner and a couple of small lunches. Perfect! That looks awesome. I’m always trying to drum up ways to play with my clay pot. Now I have a new one! In Chinatown (NYC) they sell traditional clay pots – both glazed and unglazed interiors – at incredibly low prices. I mean, like 3 to 5 dollars. The expectation is that they will crack and/or break eventually even if care is taken, so regular replacement is the rule. I’ve had some of mine last several years, probably because I don’t use them with the same frequency as some. But they are terrific cooking vessels, perfect for aromatic northern Chinese stews, classic Vietnamese caramel sauce dishes, and everything in between. They even make good oatmeal! the pork I used had very little fat around it, a thin layer on the top, so I left it on. If it had a thick layer I’d probably cut some of it off. The problem is that with the clay pot cooking, you won’t have the browning on the surface, so if the layer of fat is too thick you may have to remove it before serving, the texture won’t be too nice. I suppose you could open your pot at the end of cooking time and brown the meat by increasing the heat. It’s an idea, I guess. But, anyway, I just cooked it the way it was.